​Lyman Bracks's High School life is thrown into turmoil as he watches his best friend's throat torn open by a visiting cheerleader in the middle of the school marching band. To unravel the mystery behind Alan's bizarre demise, he must investigate his fellow seniors at Gregor Academy. Vampire cheerleader Mandy Cross, no innocent party, flees the scene with Alan's blood on her hands, dripping down her chest, and smeared all over her pretty smiling face. But her version of Alan's story is vastly different from Lyman's. Their lives are changed completely, throwing them into a climax from which few walk away. Ian writes as Lyman Bracks, dragged kicking and screaming into the world of Vampires and Helsings. 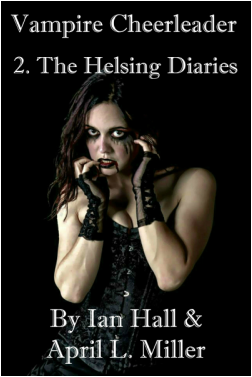 April writes as Mandy Cross, the cheerleading vampire, wrestling her conscience as she tries to survive. Lyman Bracks is a vampire hunter, a Helsing by birth and destiny. for vengeance against the vampire that turned her. organization, they determine to rid the world of this old vampire. Amos Blanche has to die. Ian writes as Lyman Bracks, dealing with vampire blood in his system as he searches out Amos Blanche. Cross, the vampire determined to inflict vengeance on her own kind. Organization to track down the leader of the vampire cult in Arizona. As the investigation deepens, he realizes that the movement is more entrenched than first envisaged, and must enlist the help of some dubious sources to regain the advantage. Vampire Mandy Cross finds herself torn between her loyalty to her friends, and the call of the vampire that turned her; group leader Alan McCartney. It's a force too strong to dismiss. themselves up against a 'rage' drug which the vampires have developed. Lyman and Mandy must prepare for all-out war. Ian writes as Lyman Bracks, in dogged pursuit of his old friend, now adversary, Alan McCartney. April writes as vampire Mandy Cross, who finds her old ties to Alan are difficult to ignore. 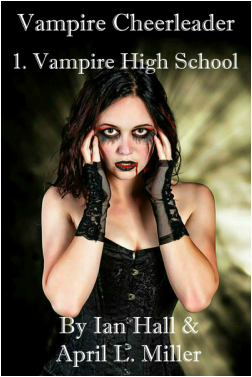 Vampire Mandy Cross and vampire hunter Lyman Bracks think they've teamed up for the easiest assignment yet... sent to California to infiltrate a vampire infested High School. They set about their task, unaware they are being watched by Howard Weeks at Unicorps, graded, and marked on their performance. To their surprise, Lyman and Mandy discover they've been thrown into the deepest, darkest, most dangerous mission ever. They team up with another two vampires, ages old, beautiful and deadly, both dedicated to the destruction of their race... but the new regime is difficult to get used to, the new pressures hard to accept. 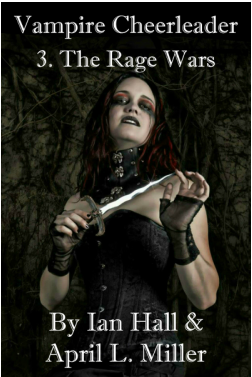 Infiltrating a huge vampire community, the odds of survival seem small, but victory would be sugar sweet, and a huge blow to the rise of the vampire horde. But even they could not imagine the scale of the vampire plan. Ian writes as Lyman Bracks, his girlfriend out of action doped by rage gas, his mission to rid the world of a new vampire group, while keeping his hands off his beautiful new partners. April writes as vampire Mandy Cross, who is finding problems with both her resolve to finish this new mission, and keeping her considerable libido under control. Valérie Berthier is born into a world of strife and confusion, spending her infancy in agony, maturing in an asylum. She must accept her destiny; she was born a vampire. She befriends a young trainee, and together they are drawn to a horrific climax between two of the world's oldest vampires. Valérie and her friend have been given specialized training, but will it be enough to help them survive? Vampires Don't Cry: A Mother's Curse, is the first in a new series, detailing the life of Valérie Berthier from her tumultuous birth in Florence in 1859 to modern times. Seen by some as the future of vampire-kind, "the most important person on the planet", she is jointly feared and venerated. This book has a distinct adult content, and deals with some adult themes, so younger readers are asked to use discretion. 21st century vampire Richard DeVere never intended to become a time traveler. When he is mysteriously catapulted back five hundred years into the dawn of the Tudor age, he suddenly finds himself in the reign of King Henry the Seventh. It’s safe to say that he’s abruptly shaken out of his comfort zone. Despite the physical advantages afforded a vampire, he feels strangely vulnerable in a medieval world where wooden stakes and arrows are the norm. He knows he must adapt if he is to survive the turbulent and barbaric times. Posing as tutor in remote Ludlow Castle, Richard DeVere is swept along in the tide of events as young crown Prince Arthur prepares to ascend the throne with his bride-to-be Catherine of Aragon. Richard's knowledge of Tudor England is sketchy at best but he remembers enough to realize that it's Arthur's brother Henry who is destined to become an infamous king. Having spent eleven months working his way into the Royal Court in Tudor England, 21st century vampire Richard DeVere did not intend to give up his hard-won position without a fight. When his nemesis, Baron Exeter, murders Richard’s lover in 1502, the resultant time ‘shimmer’ is strong enough to catapult Richard forward through time to his home in 21st century USA. Determined to return to avenge Lady Jane's death, Richard plans to duplicate the circumstances of his first time-travel adventure, but for that he needs to enlist another vampire’s assistance. Enter Renaissance Festival groupie, Steve Fraser. Arriving in Tudor England once again, Richard finds himself embroiled in a civil war, and must swiftly choose one side or the other. With his lust for vengeance curtailed because of the conflict, Richard must work himself into the heart of the tumultuous Tudor dynasty once again. "A Connecticut Vampire in Queen Mary's Court" is the second in the "Connecticut vampire" series. Alexander MacNeill simply wanted a job in publishing... now on the London streets he has a vampire mystery to solve. James Rymer struggles to write Penny Dreadfuls, and not particularly good ones. His nephew, young Scot Alexander MacNeill, arrives in London, supposedly to take a job in his Uncle James's Publishing Empire, but Rymer has been exaggerating his position. Determined to prove himself to his distant mother, Alexander takes the job as editor of his uncle’s stories, and the team bring VARNEY THE VAMPYRE successfully to the Victorian public. The Penny Dreadful Adventures are far more than a re-hashing of an old genre, they are a vignette into the lives of the times... bold, exciting, yet full of darkness and intrigue. A true glimpse onto the streets of Victorian London. The Penny Dreadful Adventures contains pages from the original texts of penny dreadfuls such as Varney the Vampyre by James M. Rymer, The Mysteries of London, by George Reynolds, and Burke & Hare by Alexander M. Mair himself. Alexander MacNeill never wanted to be a vampire-hunter, but his sweetheart is somehow mixed up in the mystery. In 1845 London, Alexander edits Penny Dreadfuls written by his Uncle, but increasingly fears the horrific vampire stories have a major basis in fact. His new sweetheart is inextricably linked to the vampires, he worries for her safety, yet cannot prove his theories. Alexander decides to follow his Uncle on one of his weekends in the country. His life will never be the same again. The Mysteries of London is the second book in the series. If you love classic vampire tales, this is a must.